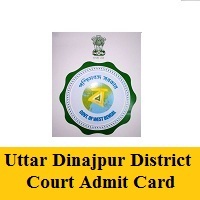 Uttar Dinajpur District Court Admit Card 2019 Released… Candidates who have applied for the posts of English Stenographer (Group B), LDC (Group C), Process Server, Peon, Farash, Night Guard can check the details on this page. The officials of District Court Uttar Dinajpur had released the Uttar Dinajpur Hall Ticket 2019. Most probably, the exam will be conducted on 31st March 2019. Hence, candidates applied for the vacant posts can either download their hall tickets from the official website @ districts.ecourts.gov.in/north-dinajpur or they can directly download from our page with the direct link provided. And the download links are available at the bottom of this page. This is a good opportunity for the aspirants who are preparing for government jobs. The Uttar Dinajpur officials announced that the Uttar Dinajpur District Court Examination 2019 will be conducted soon in the month of March/ April 2019. Furthermore, the hall tickets will be issued a few days before the examination. So, aspirants appearing for the examination download your districts.ecourts.gov.in/north-dinajpur Hall Ticket 2019. There are 43 vacant positions for the English Stenographer (Group B), LDC (Group C), Process Server, Peon, Farash, Night Guard posts of the West Bengal location. Candidates can also find the selection process for the Uttar Dinajpur District Court Examination 2019. After clearing the entire selection procedure, aspirants will get recruited for the English Stenographer (Group B), LDC (Group C), Process Server, Peon, Farash, Night Guard posts. After downloading the Uttar Dinajpur Hall Ticket 2019, candidates are required to check whether the details present on the hall ticket are correct or not. If there is any mistake, report it to the higher authorities. Aspirants attending for the Uttar Dinajpur District Court Examination 2019 need to carry some important documents to the test. Those documents list is given below. You can carry any of those documents. Follow the below steps to download the Uttar Dinajpur Admit Card 2019 from the official site. To download Uttar Dinajpur Hall Ticket 2019, candidates need to enter the official website of District Court Uttar Dinajpur i.e., districts.ecourts.gov.in/north-dinajpur. After entering into the official website, carefully observe the home page. On the home page, you can find the Latest Notices section. In that, you can find the flashing links. Search for the Uttar Dinajpur Hall Ticket 2019. After finding the link, click on that link and give your details such as date of birth, registration number. Check your details clearly and click on the submit button. Download the admit card and take the hard copies of it. Interested candidates can grab this opportunity. We hope that the information given on this page is useful for your reference. Refer to the official website @ districts.ecourts.gov.in/north-dinajpur for any other information. The exact dates are not yet released by the officials. We will update you soon with the exam dates. So, visit our page frequently for the latest updates. If you have any queries, you can contact us at freshersnow.com. All the best for all the aspirants. Thank you.